LAUNCHING the X6 in 2008, BMW introduced the concept of the SUV as a pure fashion accessory. A gargantuan beast based on the X5 wagon, the X6 is the Kardashian of SUVs. All bum but no talent. BMW has since sold more than half a million of them, which just goes to show that not all SUV buyers are pragmatic, intelligent people. 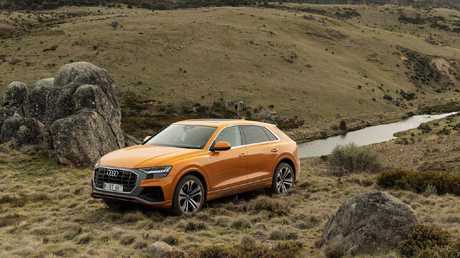 Imitators inevitably arrived, the latest to follow the formula being Audi's new flagship SUV, the Q8. 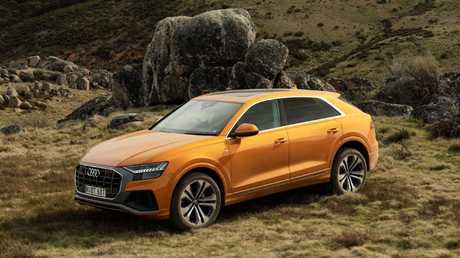 It's derived from a spacious, versatile family wagon - the seven-seater Q7 - and comes with a sleeker, sharper suit, a coupe roofline and a few dimensional adjustments to give it a sportier stance. For the finishing touch, whopper 21-inch alloys fill the wheel arches and make the body appear smaller that it is. The Q8 is based on the seven-seat Q7. 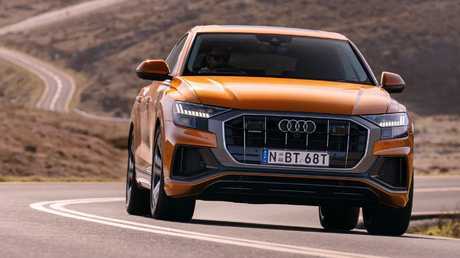 It's the work of Audi design chief Marc Lichte, the first Q SUV with his signature shallow, framed octagonal grille that will define the brand's future models. Audi's Q wagons to date have been stodgy looking devices but the Q8 is a muscular, edgy thing, with blistered guards, frameless side windows and a much trimmer set of glutes than the BMW. 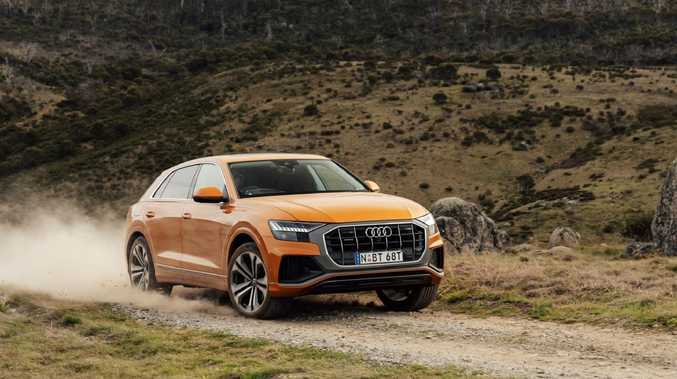 Unlike the Q7, it's a five-seater, with a shorter, lower, wider body sitting on the same wheelbase - the same VW Group platform underpins Porsche's Cayenne, next year's VW Touareg, the Bentley Bentayga and Lamborghini Urus. The more compact body doesn't compromise interior space for five. Seating is luxurious and in the back stalls there's ample, adjustable legroom and decent headroom. Boot volume is about 15 per cent less than Q8 ??? in five seater mode, but still expansive. The Q8’s styling means it could only ever be a five-seater. The Q8 launches solely as the 55TFSi quattro, priced at $128,900. It runs a 3.0-litre V6 turbo with 250kW of power and 500Nm of torque, powering all four wheels via an eight-speed automatic. It's a mild hybrid, with 48V electrics, lithium-ion battery and starter motor that, when you plant the accelerator, can also give the engine a high voltage boost of up to 6kW and 60Nm for five seconds. The engine is also switched off and decoupled from the transmission in "coasting" mode, on a light throttle between 55-160km/h, yielding fuel efficiency gains on the highway. It restarts when you press the pedal and the whole stop-start process is imperceptible unless you glance at the tacho. The Q8 is loaded up with advanced tech features. The driver faces Audi's latest all-digital centre stack dash, with a 10.1 inch touchscreen for infotainment, plus an 8.3 inch screen below it for vehicle settings, heating and cooling. Both screens use a haptic interface, which gives subtle feedback and a muted click when you touch an icon, mimicking a conventional switch. You have to give the icons a serious poke - sometimes two pokes - to get a result but at least they're big, clear and easy to hit. Audi ups the safety tech ante in a big way on the Q8 - there are 39 driver assistance features to look after you. A 3D virtual image of the car on the infotainment screen can be rotated 360 degrees, so you can see any obstacle nearby before you begin to move, while autonomous emergency braking extends to stopping the car if it detects you're about to be T-boned at an intersection. 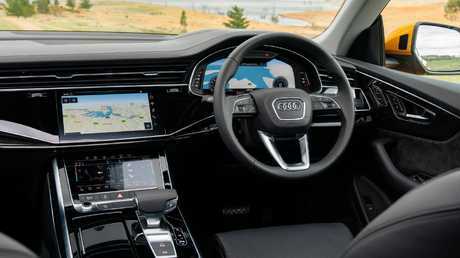 Standard equipment includes power tailgate, adaptive suspension dampers, adaptive cruise, LED headlights, three zone aircon, head-up display, Audi's 12.3 inch Virtual Cockpit instruments, heated and ventilated front seats upholstered in supple Valcona leather, navigation, digital radio and Apple CarPlay/Android Auto. The cabin is a truly luxe space. For $11,000, the Premium plus option package includes 22-inch wheels, air spring suspension, matrix LED headlights, four zone aircon and customisable LED interior lighting. Variable ratio steering is packaged with rear-wheel steering for $4500. Metallic paint is a $2300 gouge. Arriving mid-year at the same $128,900 price and specification, the 50TDi quattro will pack a 3.0-litre V6 turbo diesel (210kW/620Nm). Giant wheels help the body look smaller than it is. Audi claims a seriously rapid 5.9 seconds for the 0-100km/h sprint. Seat of the pants says the Q8 isn't that fast. The beautifully smooth 3.0-litre V6 is certainly potent but peak torque doesn't kick in until a high 2900rpm, so it's not particularly strong at low revs. The eight-speed automatic is very slow to respond when you want a lower gear, even in Dynamic mode, the most aggressive of seven selectable settings. It's a shame that adaptive air suspension is available only in the $11,000 Premium plus package, because it allows you to tailor the ride-handling compromise to suit the road, the load and your speed. I didn't get to drive the standard steel-sprung variant but colleagues who did reported that the ride was much lumpier and harder than the air sprung examples I drove, which ironed out a rough road with grace and authority. The Q8 isn't a sports SUV. It weighs 2265kg. Enough said. However, it's stable at speed, takes corners in a flat, well-balanced manner with the adjustable suspension turned up to taut, and has powerful, progressive brakes. 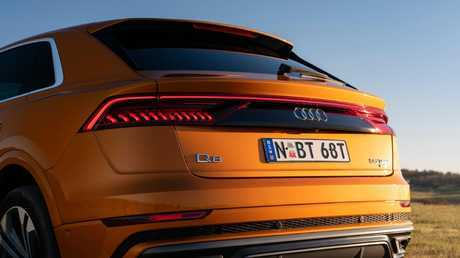 The Audi’s rear end is up for much debate. A notable dynamic demerit, common on Audis, is imprecise, inconsistently weighted, uncommunicative steering. I can't say I noticed any real benefit from rear-wheel steering, either. If you want a big SUV that really handles, get a Porsche Cayenne, priced at $115,900 for what is basically the same running gear, minus the 48V set-up. 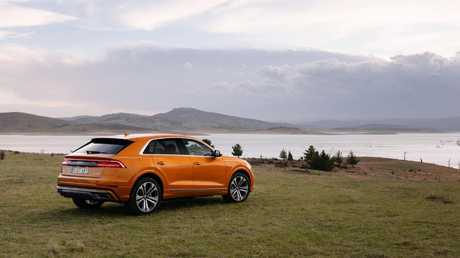 Or wait for the SQ8 or Q8 RS hotrods, yet to be confirmed but odds-on within a couple of years. Audi combines high-end luxe, dazzling tech and bombproof safety in a slick stylish package but as a drive the Q8 is competent rather than class leading - and it's pricey, too.